A renewed level of optimism surrounds Britain’s female sprinters as their gradual rise toward world dominance gains pace after a summer filled with European and Commonwealth success. At the forefront of both the challenge and the current media attention that encompasses the new-found buoyancy are two women who have quite a lot in common. Not only do they share the same surname, school year and sometimes training base, but they won their first senior international medals in the same race. On July 31 this year, in what could prove to be the pivotal point in the British regeneration, 20-year-olds Jodie and Bianca Williams, both racing in their first senior international finals, defied the weather and their more experienced rivals to win silver and bronze in the 200m at the Commonwealth Games in Glasgow. Roared on by the magnificent Hampden Park crowd, they went past their Jamaican rivals on the final bend to claw their way on to the podium and smash their personal bests, finishing behind only Nigerian superstar Blessing Okagbare. They left the home crowd rocking and Team England in delirium. As their times reached the scoreboard and things became real, the pair revelled in becoming the second and fourth fastest Britons ever; jumping up and down, hugging each other as tightly as they could, sharing their pure ecstasy and general disbelief at what had just happened. Three months on and for Bianca, who later finished fourth at the European Championships, the shock at what happened that night still remains. “The 200m has to be the best thing I have ever done, it was just absolutely amazing. It still doesn’t seem like it happened. It still seems so surreal,” she says. The main reason for the surprise behind the pair’s success was not their youth, but instead their injury record. For Bianca, 2014 was her first full season in three years after multiple hamstring injuries, with Jodie suffering from the same injury for much of the last two. Just by avoiding getting injured, Bianca had a reason to celebrate and so when she managed to qualify for the Games, it was a shock in itself. She explains: “Even starting 2014, the Commonwealths were never in my mind. When it got to March and I was in America, one of the other coaches there said ‘What’s your aim for this year?’ and I said ‘I don’t really have any because what if I don’t make them, what if I don’t achieve my goals?’ and she told me, ‘You’ve always got to have those goals’. For Jodie, one of Britain’s greatest ever juniors, it was a rather different journey aside from the injuries; oddly for someone of her age, her performances this year were seen by many as a great regeneration of her career, rather than a breakthrough. By winning silver in the 200m at both Glasgow and European Championships in Zurich, the once unbeatable youngster says she was able to feel ‘back to her junior self’, a period where she felt almost unbeatable. “I would honestly get on the track and there was never anyone I believed I couldn’t beat. Even if you had put me on a track with Shelly-Ann (Fraser-Pryce) I would have believed I had a chance to win and I think that confidence played a massive part in why I was so successful,” she says. While Jodie’s confidence was well deserved, inevitably it didn’t make her invincible to injuries. Cruelly denied a chance to run at a home Olympics in London by a hamstring tear in the final of the 100m at the British trials, it was an issue that would continue to hamper her performance through 2013. Struggling to get back to the form that had once seen her go 151 races unbeaten over a five-year period, Jodie came into 2014 short on confidence and feeling the pressure: “Before the season started I didn’t really have a lot of confidence,” she recalls. “In the last year I’d really struggled with it at the worlds and even at my under 23 competitions, where I felt really out of place, I didn’t feel like I belonged there. “Any athlete can tell you; being out for a little while and then not running the times you think you’re going to run can really have a massive impact on you,” Jodie adds. One of her lowest moments came at the 2013 European Under-23 Championships when she faced Dafne Schippers in the 100m, with a weight of expectation on her shoulders. “For me it was a real struggle,” she remembers. “Dafne was there and a lot of pressure was being put on our 100m race. Everyone was saying we were the ones to watch and it was going to be a really good battle. However, the meeting ended on a high for her as she won 200m gold a day later. In the same final Bianca’s challenge was sadly halted by another hamstring injury causing her to DNF. 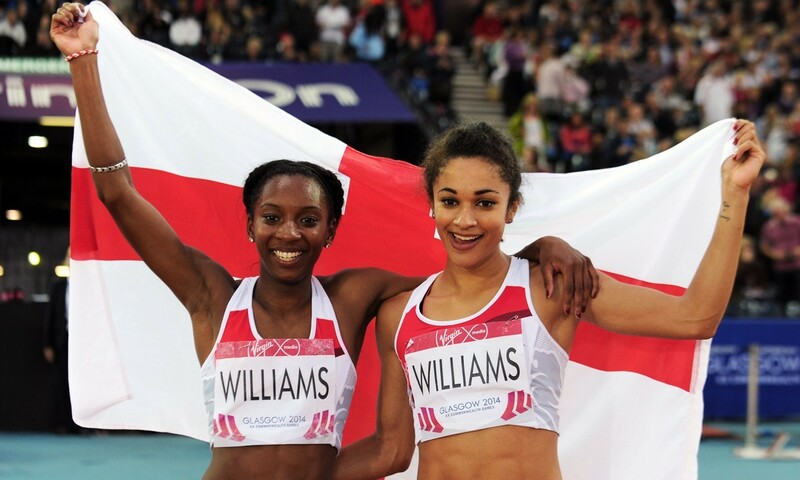 As their injury issues of 2013 started to die away, the Williams girls began their 2014 outdoor season better than expected – first smashing their personal bests in the Florida sunshine, before both finishing runner up to Allyson Felix in big events (Jodie in the Oslo Diamond League and Bianca at the Ostrava Golden Spike meeting). After further success for both at the British trials in Birmingham, Jodie clinched her major breakthrough at the Glasgow Diamond League. “The biggest turning point for me was there when I ran 22.6. It put me into the mix for actually being in the medals for the Commonwealth Games,” she says. Back in Glasgow two weeks later, Commonwealth glory was claimed not just for Jodie, but Bianca too, a factor that Jodie believes made it extra special. Yet, this summer’s success wasn’t exclusive to just two athletes. In total Britain and England won six senior medals in the women’s sprint events in Glasgow and Zurich as well as Dina Asher-Smith taking world junior gold. Add to that the fact that four athletes ranked in the world’s top 20 for the 200m and it’s easy to see why optimism is rife for further success at next year’s IAAF World Championships, just two years after GB’s women couldn’t even qualify a 4x100m team for the London Olympics. Despite the added competitiveness of selection making it more difficult now to make the British squad, both athletes are certain they prefer it that way. “It’s amazing,” Jodie adds. “I really think leading up to the Olympics and the World Championships in London, you’re going to see a big drop in time from everyone and some really special performances. Aside from the individual events, Britain’s relay results, are better than ever as proven by this summer’s two amazing performance at the Letzigrund Stadium, Zurich, where a team of Asha Phillip, Ashleigh Nelson, Anyika Onuora, Jodie Williams and Desiree Henry smashed the British record twice in two weeks, to win European gold and then take victory in the Diamond League. Alongside her inclusion in the shorter relays, many have touted Jodie Williams to play a part in the 4x400m relay squad and it’s an idea which excites her. That feeling is echoed by Jodie, whose success in 2014 provides a huge step towards her long term plans for 2016 and beyond, not that she’s planning on focusing on anything but the short term future. No one can predict what will happen to either athlete in the months and seasons ahead, but one thing’s for sure, after a rocky few years, both are heading in the right direction.